We’ll jump right into it this week starting with some new arcs, series, and miniseries that hit the shelves this week. First up is Fanboys VS. Zombies #13! Who better to deal with a zombie outbreak than the very people who have killed them in countless hours of video games? Nerds of all kinds must deal with zombies in Fanboys VS Zombies. 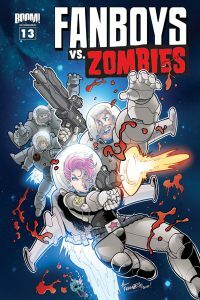 And this newest arc finds them battling zombies in space! After seemingly holing up in some sort of bunker and ridding the immediate area of zombies, the group has made a startling discovery. There were scientists in this bunker that were working on a cure. A cure that could possibly turn the zombies back into normal people. With this in mind, they make a point of saving one last zombie to test this cure on, only to be launched into space through some unfortunate bumping. The scientists on the space station get ready for the incoming pod and prepare to kill anything that is undead. Shane Houghton did an interesting job with the writing. It’s a fun story and the use of flashbacks to essentially tell the story in reverse was an interesting idea. It was a cool way to draw a new reader further and further into the backstory, as it did with me, but also left the story feeling just a tad bit disjointed. Even so, it was a fun way to tell the story. The accompanying art by Jerry Gaylord brings the issue together. Gaylord’s art is a bit cartoonish and silly, but ultimately works perfectly for the story. It’s not the most serious of stories, so a bit of fun and flexibility in the art is a plus. Overall, it’s a good read, but fails to explain the backstory enough for new readers. I’m sure it’s a great read for current fans, but as a new reader, I felt left out. I had no idea who any of the characters were and it wasn’t explained to me. It’s a good comic, but not as new reader friendly as it should be. Parental Concern: Moderate. Blood, guts, zombies. Many a comic reader remembers He-Man. Whether it’s the cartoon, the toys, or the comics, He-Man has been a popular commodity. 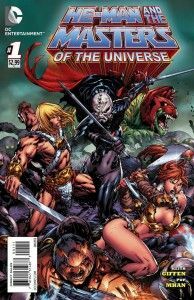 With this new ongoing series, a dark force is attacking Eternia and it’s up to Adam and the rest of the Masters to repel the invaders and save the day. Adam and the rest of Eternos are at a funeral for Teela, a powerful mage. While this is happening, all across Eternia a villain named Despera is invading with a huge army. It’s only after the funeral that Despera attacks Eternos and He-Man must meet her in battle. In the final page, Despera is revealed to be a familiar face. The writing is a bit stale, in my opinion. It almost seemed unnatural for many characters. And the scene on page 12 or so where a female character strips to her underwear in the hallway, all while talking to her father and two other men, seemed so odd and out of place. It seemed to serve no real purpose other than to get her into her underwear, which was just mindblowing to me. I actually had to reread those couple of pages a few times to make sure I didn’t miss some big conversation or something. The art, on the other hand, was great. If the original cartoon had looked this good, I think I would be more eager to rewatch old episodes. It’s well-suited for action scenes, which there are sure to be many of. For new readers, there is no grounding for anything. No characters are adequately introduced, no events are even remotely given exposition. It’s just flying blind. I have some basis in the characters and story, but still felt largely lost while reading. It’s definitely only for readers who have read past miniseries and other related things. Atomic Robo is all about the robot that Nikola Tesla built in the early 1900s. It’s a great blend of science fiction and history that makes for one of the most fun comics being made. 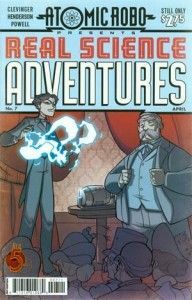 Real Science Adventures is a spin-off title that features stories that further expand the Roboverse and often focuses on characters that aren’t just Atomic Robo. In this newest arc, we see Robo’s creator, Tesla, surrounded in conspiracy and dangerous plots as he seeks to give free energy to the world. Tesla is showing off his means of wireless energy transmission when he is attacked onstage by gunwielding thieves. Though he uses his electrically charged suit to deflect the bullets and ultimately recover his stolen device, he suddenly realizes it’s all been a ruse. They were really after much more and stole a secret project that Tesla had been working on. A shady group has stolen Tesla’s work in order to stage a violent takeover of America. Brian Clevinger consistently makes any and all Atomic Robo books one of the best books on the stands. It’s like an optimistic Hellboy. There’s action, adventure, plots, and humor all in a snappy package. His absurd blend of history and fiction makes me wish Tesla really did invent a talking robot. Real Science Adventures has been a way for Clevinger to further explore the history behind the Robo comics and an arc focused on Nikola Tesla and his electrical suit makes the best kind of sense. The book is always wonderfully drawn in a way that captures the optimism and humor of the book while also catching the action and adventure that is often found in the pages. New readers, dig on in. Never read any Robo? Don’t worry! He probably doesn’t even show up in this whole arc, so you won’t miss anything. If you don’t read this issue, you do miss Nikola Tesla flying by using electricity channeled through his suit. You make the call. Harbinger Wars has taken the Valiant Universe this last few weeks. Now, it’s coming to Bloodshot. 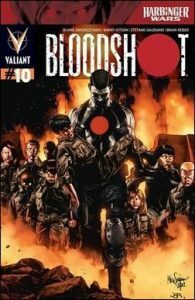 This is the first of a four part arc in which Bloodshot, the super soldier created by Project Rising Spirit, rescues and cares for powerful psiots that were being held by Project Rising Spirit. It’s sure to be an eventful arc as conflicts are sure to arise. Bloodshot leads his ragtag group of psychic children out of the testing lab and into the desert. On the way to their destination, some mercenaries stop the group, only to be taken down by a combination of psychic powers and Bloodshot’s guns. It’s only after this battle that they reach their safehouse and Bloodshot gets the kids food and water. It’s only in the last page that a very big presence in the Valiant Universe shows up and complicates things considerably. The writing on the book always keeps it moving at a fast pace and is action-packed. At times, as with the last page, the dialogue can feel a bit contrived, but it usually feels very natural for the characters. The art is great for portraying all the action and gore that Bloodshot is usually involved with and helps bring the book to a higher level of work. The combination of the two makes for a rather satisfying issue and a satisfying series overall. New readers, read that introductory page. If you do that and understand it, then you’re golden. With that background information, this issue is a great way to jump into Valiant comics as it crosses over with Harbinger, thus exposing a reader to titles at once. It’s an action-packed read that is quite unlike anything on the stands. Parental Concern: Moderate. Violence, blood.